I am a slippers and PJ’s girl ALL DAY! The first thing I do when I get home from work or going out is put on my PJ’s and slippers. It doesn’t even matter if I was just in a sweatsuit or comfortable outfit all day. Home = pajamas & slippers. I am all about comfort. Ask anyone who has worked with me in an office setting over the years. Every morning while choosing an outfit, I don’t go for fashion, I go for comfort. Comfort is Key! You will hardly ever see me in high heels. Most of the high heels I do own are from my mother’s closet. All they do in mine is collect dust. I can only wear them for about an hour tops before my dogs start barking (aka my feet start hurting lol). Over the years, I have had different types of slippers. Knee high slippers, slip on slippers, Mahabi slippers, cheap, expensive, sweaty slippers. At some point in my life, I became obsessed with Uggs (didn’t everyone?). 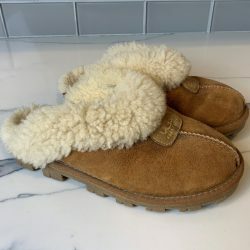 I think because I LOVED my Ugg boots, I thought that the comfort would automatically translate into a slipper. And while it did in some ways, I found that not all Uggs are created equal. As I get older I am beginning to realize that there is more to life than Uggs! The last couple pairs of Ugg slippers I have owned just didn’t do the trick and weren’t worth the price tag. (Before you all go nuts, I love my Ugg boots, I am referring to the slippers I have owned). Over the past decade I have had 3 types of slippers. 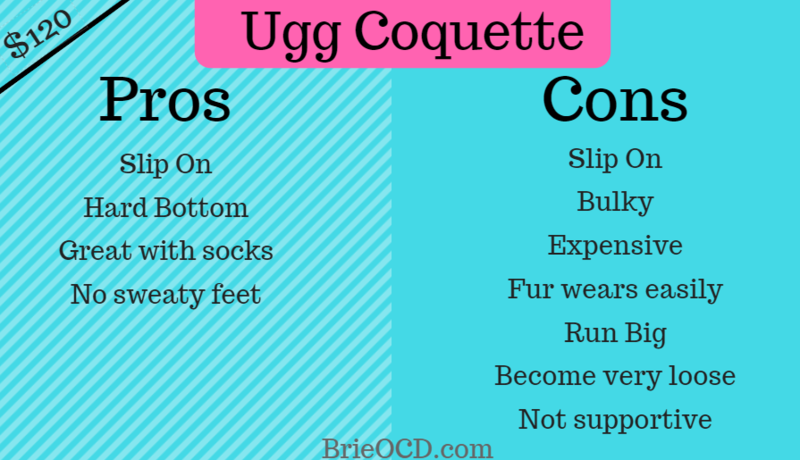 For the better part of that decade I only wore the Ugg Coquette slip ons. Then one day I realized why do I keep wearing these slippers? I scuff all around the house, I keep tripping and I am going to end up hurting myself. So I asked my mom for the Ugg Dakota Moccasins. BAD IDEA. These slippers are uncomfortable. They have stitching along the toe line and it digs into your feet. I sent the first pair back because of it, thinking I just had a faulty pair and then the second one came and I had the same issue. No Bueno. Then came along Mr. LL Bean. I was at my mom’s house for the holidays and I asked to borrow a pair of her slippers. She gave me the LL Bean Wicked Good Moccasins. I was in HEAVEN! Luckily my mom is the most generous mom on the planet and she let me keep them! SCORE! 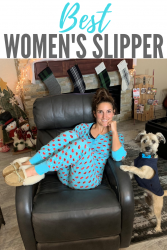 Below, I will tell you what I think is ultimately the Best Women’s Slipper I have experienced by going into the pros and cons of each slipper. 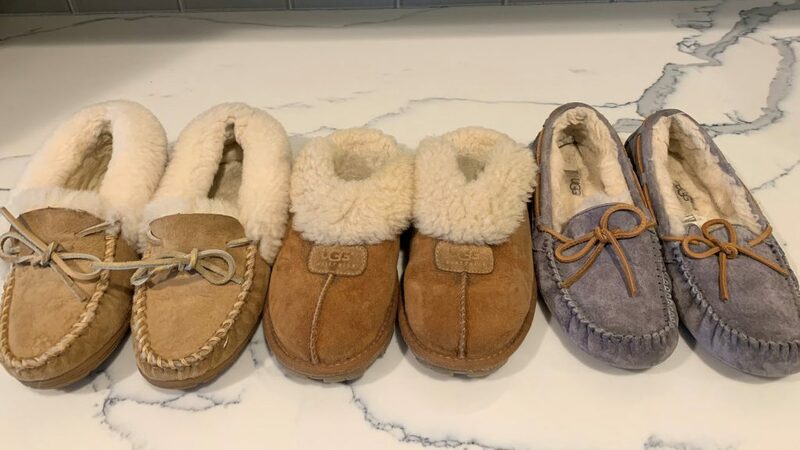 LL Bean Wicked Good Moccasins, Ugg Coquette and Ugg Dakota. Remember that these are my opinions, I obviously haven’t tried every slipper in the world, and where I see something as a con, you might see it as a pro. This is just my take and my thoughts on the 3 brands/styles and my personal experience. These are hands down my most favorite slipper that I have owned. They are secure on your foot, yet still easy to get on and off. They keep my feet warm but NOT sweaty and are just super comfy. Honestly the only con in my opinion is that the laces come undone, however you can easily cut them and then that issue is resolved. I also note that they aren’t extremely supportive but keep in mind that we are talking about slippers, not sneakers. You won’t be hiking Kilimanjaro in them. They are perfect for me BUT if you are looking for arch support or super stability these may not be the slipper for you. 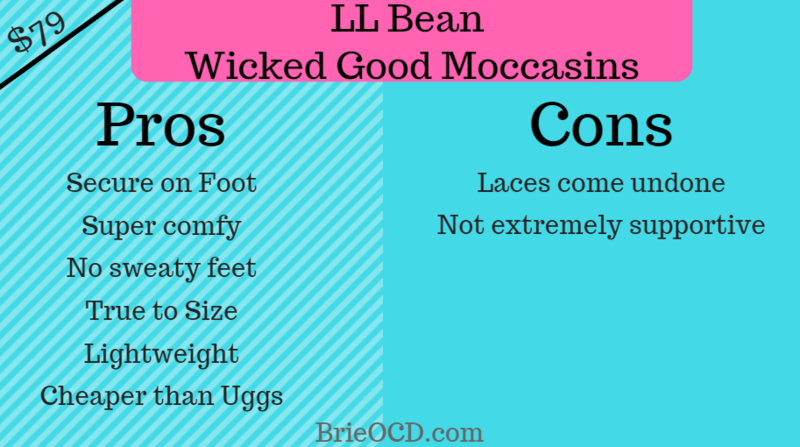 I LOVE my LL Bean Wicked Good Moccasins. They are truly Wicked Good!! (please note, yes I am from RI but I do not say wicked, that’s Massachusetts for ya!) They also come in Men’s! Click here to view/buy and get the coupon code below! Ok, so I wore these slippers for years! I received a knock off pair years ago that have now become my dog walking slippers and then I also have a newer authentic pair that have been semi-retired for months because I was going to end up breaking my hip if I continued to wear them around the house. 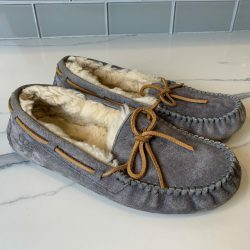 The main issue with these slippers is the the fur inside wears down way too quickly and then the slipper is too loose. Loose slip ons are a major hazard to anyone’s health. You start scuffing around the house, cramping up your toes trying to keep them on and tripping up the stairs. I think after my 20th trip up the stairs, I said I need to stop wearing these. If I wasn’t so spry I could’ve really injured myself. These slippers are expensive and run big (buy one size down) and I just don’t think they are worth the price tag. The best part about them is the really bulky hard bottom. Great for getting the trash, mail or walking the dogs. 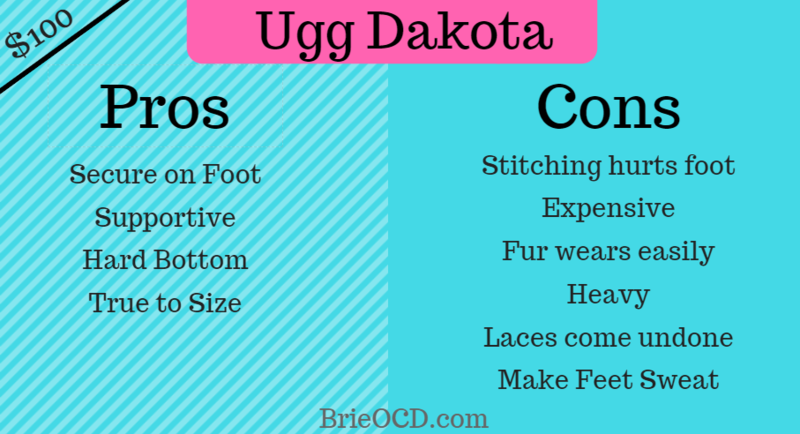 So after I decided that I needed to retire my Ugg Coquettes I asked my mom for Ugg Dakota’s for Christmas. I was so excited when they came! 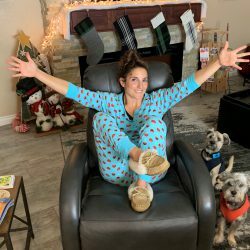 A slipper that stays on your foot and won’t kill you! However, almost immediately after putting them on I could feel something grinding against my baby toes. The dang stitching! I figured I just received a faulty pair so I returned them and waited for the new pair. The new pair came and they did the same exact thing! Who wants to wear slippers that hurt your feet? Not this girl!! I don’t even think I need to get into the rest of the pros and cons because the whole point of a slipper is to keep your feet warm and be comfortable. These do keep you feet warm, but so warm that they sweat and they aren’t comfortable. Thank you, Next! So there you have it! My favorite and not so favorite slippers! I hope this was helpful to you! If you want to buy any of these slippers you can do so by clicking on the links below! LL Bean is only sold on the LL bean website but I have included a coupon code for 25% off! MACY’S IS HAVING A REBATE offer as we speak. $10 off $50 or $25 off $100+. Simply purchase something using one of the affiliate links below and fill out the rebate form by clicking here. You will need your order number, paypal email address (to get paid) & date of purchase! That’s it! DEAL ENDS 11:59 PST on 12/31/18. 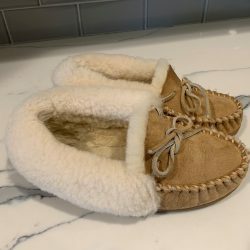 LL Bean Women’s Wicked Good Moccasins (NOT sold on macy’s or part of the rebate offer) – Promo Code – GIFT25 worked for me! 25% off!